TEL AVIV — Wilyat Sinai, the Egyptian branch of the Islamic State organization, has released a video in which it accuses Hamas of betraying Islam and fighting jihadists in the Gaza Strip, escalating the ongoing propaganda war between the two terrorist groups. The climax of the video shows a former Hamas member and the son of an official in the organization executing another Hamas member accused of being an agent who infiltrated IS, helped Hamas smuggle weapons and gave the organization information on jihadists in Gaza who were coordinating with IS. Hamas has coordinated with the tyrant against the faithful, claims the video as it shows a meeting between Hamas leader Ismail Haniyeh and Egyptian intelligence officials. The IS member in the video describes the Hamas regime in Gaza as made up of infidels and claims the organization fights Sharia law, oppresses the mujahedeen, raids homes and puts the mujahedeen on trial while adopting infidel Western policies. “But it’s not surprising that they are loyal to the idol called interests,” the narrator states. 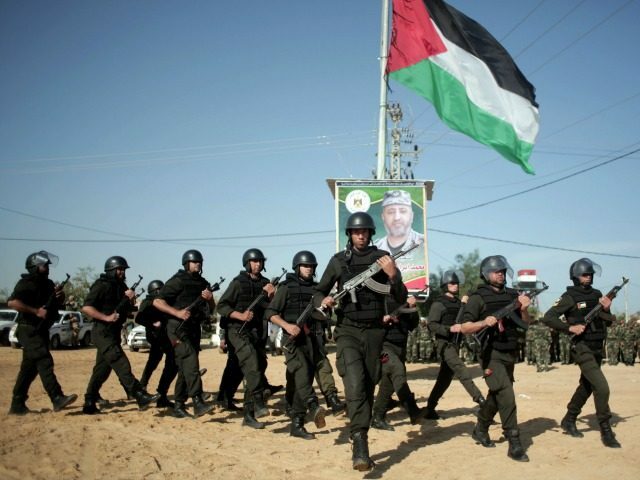 The video also showed Hamas leader Khaled Meshal announcing Hamas’ new charter, in which the organization claimed it recognized the so-called 1967 border lines. IS propagandists claim that Hamas exchanged its “divine” charter for an “infidel” one. Meshal and Haniyeh were also seen in the video alongside Abu Obadia, a Hamas military spokesman, thanking Iran for its support and blessing Iran on the anniversary of the Iranian revolution. The climax of the video showed Rashed al-Dajani, a former member of the Izz ad-Din al-Qassam Brigades, Hamas’ so-called military wing, executing another Hamas member. Al-Dajani is the son of Yehya al-Dajani, a high-ranking official in Hamas “military wing” who has escaped a number of assassination attempts, the latest being a missile strike on his home during the last war between the IDF and Hamas in 2014. Al-Dajani’s son managed to cross into Sinai during the month of Ramadan last July through the tunnels that connect Gaza to the Sinai Peninsula. Together with a number of other jihadists who defected from Hamas, he joined the ranks of Wilyat Sinai, the Egyptian branch of IS. The Hamas member executed by al-Dajani in the video was identified as Moussa Abu Zaamout, a resident of Rafah in southern Gaza who was accused of being a Hamas agent who had infiltrated the ranks of Wilyat Sinai. The video caused an outcry in Hamas not only because of the executioner’s identity, but also the fact that the video labels Hamas as a group of infidels coordinating with al-Sissi. Hamas aims to reach a reconciliation agreement with Fatah despite calling them infidels during Hamas’ takeover of the Gaza Strip in 2007. Meanwhile, al-Dajani’s family said that they do not recognize him as a family member any longer and that they are innocent of having any contact with him. In their statement, the family called the actions of al-Dajani despicable crimes that do not represent the spirit of Islam or the values of the Palestinian people.